My mom and I had a lengthy discussion on Friday about lilies, what makes a pretty lily, whether we should buy exotic lilies, which ones we've bought all while we looked at her lilies. This morning, one of my more exotic lilies opened and I wanted to send her a photo, but being the techno savvy person that I'm NOT, I can't make my photos small enough to email several at a time, so you all get to see my lilies this morning. This second one is my favorite. It is an Oriental lily (I believe). 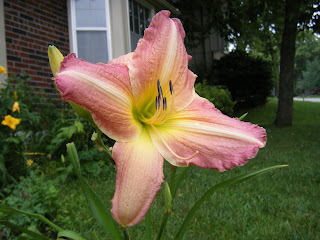 The foliage is more leafy like a daylily, but the leaves are fuller and the overall foliage is much thinner. The flowers bloom one at a time. 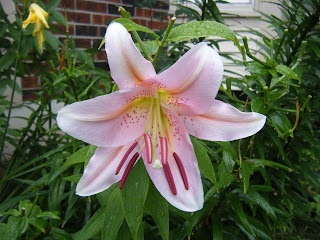 I greatly prefer the Oriental lilies of the exotic lily choices. The bottom lily is another of my Oriental lilies. I have several of this one and of course they double every year. I am especially fond of the Pepsi bottle hiding down in the foliage. And, that's about all I know about my lilies this morning. My daylilies aren't blooming yet. They re also lovely and give you the most bang for the buck. Especially when you mooch the plants off your mom and stick them in the ground off season, just to see what happens. I just started blogging and found yours because we list a common favorite book - Gone with the Wind. Anyhow, I have two "Charmings" and love lilies, too. Just FYI - the first picture you show is a Mona Lisa lily. It's similar to a StarGazer, but not as intensely colored. Both Mona Lisas and Stargazers are Orientals. The Asiatics are similar, but have differently shaped petals and thicker stems. 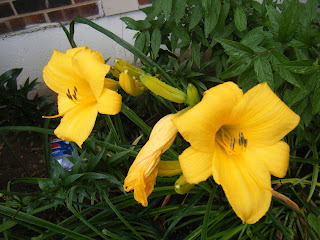 The second photo you show is a day lily. I'm not sure which variety - there are hundreds. But regardless of what they are, they're gorgeous!!! Crickets and Hail and Termites, Oh MY! As if I Haven't Griped Enough About the 'Mart.